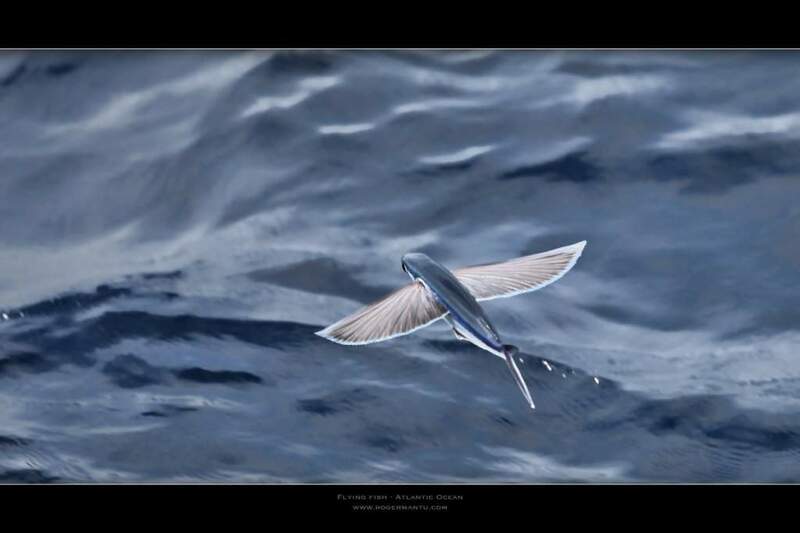 Exocoetidae, commonly called Flying Fish, is a family of fishes aptly named for their ability to emerge out of the water and glide for long distances with their outstretched pectoral fins. Their streamlined torpedo shape helps them gather enough underwater speed to break the surface, and their large, wing-like fins get them airborne. Once in the air, these fishes can glide over considerable distances. Their flights are typically around 50 meters, but some fishes have been recorded to fly up to 200 meters or more. Some species of flying fish have enlarged pelvic fins as well as enlarged pectoral fins, which allows them to fly further than two winged gliders (up to 400 meters), and have far greater maneuverability. These fishes are known as four-winged flying fish. To glide upward out of the water, a flying fish moves its tail up to 70 times per second. It then spreads its pectoral fins and tilts them slightly upward to provide lift. At the end of a glide, it folds its pectoral fins to reenter the sea, or drops its tail into the water to push against the water to lift itself for another glide, possibly changing direction. The curved profile of the "wing" is comparable to the aerodynamic shape of a bird wing. The fish is known to take advantage of updrafts created by air currents to increase its time of flight. Flying fish are thought to have evolved this remarkable gliding ability to escape predators, of which they have many. Their pursuers include mackerel, tuna, swordfish, marlin, and other larger fish. Unfortunately, this evasive maneuver is not enough to escape the biggest predator on earth – humans. Flying fish is commercially fished in Asian countries such as Japan, Vietnam and China, including the Caribbean where it’s a coveted delicacy. In Japanese cuisine, the fish is used to make some types of sushi. It is also a staple in the diet of the Tao people of Taiwan. In Barbados, flying fish were threatened by pollution and overfishing, changing the occurrences of flying fish in the waters off of Barbados. This sparked a fishing controversy between Barbados, and Trinidad and Tobago.